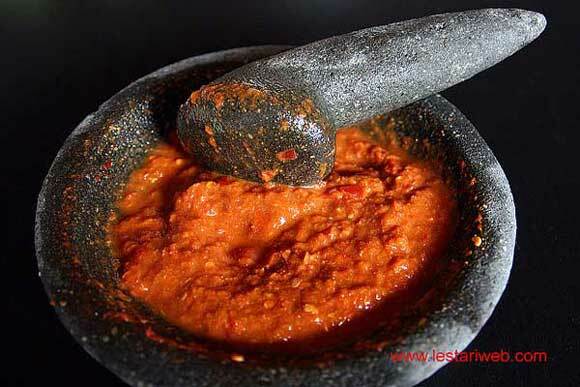 This sambal is suitable to accompany your Ayam Penyet or Tempe Penyet as other alternative from Sambal Kencur. Ayam Penyet or Tempe Penyet is Fried Tempeh or Fried Chicken which is lightly bruised /crashed in a cobek or mortar using a pestle, laced with sambal terasi penyet, cucumber & raw vegetables. This dish is originally comes from East Java Region but now is becoming popular around the nation even in our neighbouring countries such as Malaysia & Singapore. 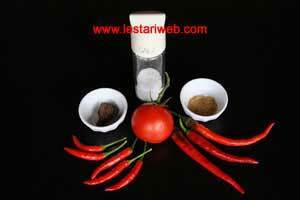 1Put large & bird the chillies in a grinding stone (ulek-ulek) or use mortar & pestle and grind until smooth. 2Add the chopped tomato and grind into smooth paste. 3Add the roasted shrimp paste, grind them once again. Stir to mix. 5Put fried tempe/tofu or fried chicken on it and bruise/crush slightly with the pestle. 6Serve right away with rice and raw vegetables / lettuce.